The Estonia Flag features a simple and striking design of three equally sized horizontal bands, which are colored light blue at the top, black in the middle and white at the bottom. The flag is known as "sinimustvalge" in the Estonian language, and is used to represent the country's government on all national and international occasions. The flag's color scheme is famously linked with the Estonian poet Martin Lipp, who wrote "The Estonian Flag," which is a statement of Estonian nationality which is similar in its way to The Star-Spangled Banner or La Marseillaise are a statement of national identity to the United States and France respectively. To Estonians, the light blue, black, and white are akin to the the red, white, and blue of the flags of the USA and France. The light blue color represents the beautiful and vast sky which Estonia looks on to its west and north. The country is low lying, mainly on the Baltic Sea, and has spectacular views. Lipp included the light blue in the Estonian national poem to express this wonder of nature which is apparent all around. 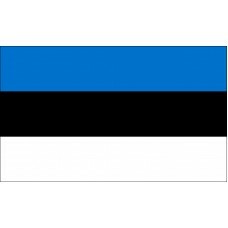 The black band of the nation's flag signifies both an attachment to the land and Estonia's history of hard times. The country has been part of many empires, and lies at the far west of Russia and to the north of Germany. Its people have their own unique identify, of which they are very proud. Their country sits on a stretch of sea which has been pivotal in world history. The white band at the bottom of the flag represents purity. This is in reference to the Estonian national values of continence and honest work. It literally underlines the Estonian people's belief that they will prevail due to their national character. They have been invaded by numerous foreign countries for hundreds of years, but remain stalwart. The country has dramatic landscape features due to its position at the edge of the Baltic Sea. It is also part of a rising plateau of land known as the East European Platform. This literally elevates Estonia above many other countries. To the north of the country lies the Gulf of Finland, a part of the Baltic Sea which highlights the differing landscapes of mainland Europe from that of Scandinavia. Estonia has a history which dates back to 9000 BC. It was the last European country to accept Christianity, and has a strong pagan culture. Its people are ethnically and culturally similar to the Finnish population. Estonia is strongly allied to Western Europe, although it has a border with Russia. Its people have a richly independent history, which is reflected in the Estonia flag.